Sheikh Ramzy’s lecture this week reminds me to what we discussed in C101K (or C101M) regarding indoctrination in faith based school and curriculum. After consulting and debating Neil Burtonwood’s and Michael Hand’s articles, we came to a solid conclusion that Islam is not an indoctrination, and therefore, all aspects of the Deen are friendly to reasoning and learning. They are even considered as the pillar. Even the peak of Islam which is the Shahadah La Ilaha Illallah, is also meant to be achieved through the process of knowledge. He asked, and he used analogy. When one person came and asked if she should perfom Hajj for her deceased mother, Rasulullah PBUH did not give plain and dry answer by simply saying yes. He compared the topic to another context, if her mother owed some debt to other, should she pay on behalf of the mother? The context is different but the principle and application are similar. There are many ways how Rasulullah PBUH sparked and encouraged inquiry. The main issue now is, how to spark inquiry in our students’ mind? I would say, this is the BIGGEST challenge we have in our school. We know, all our children regardless of the family background etc, they were all curious during their toddler years. They asked, they investigated, they tried, everything. Suddenly we realise that all those things disappeared. Students sit in the classroom, waiting for spoon-feeding. They hardly ask questions. And in our country, many might consider the silence as discipline and obedience, which are good for them, and the teachers too. I was specifically appointed by the Board to solve this issue in our school. After several months analysing all aspects of the school operation, with guidance from ITEP C101 and C102, the first thing I proposed to the Board was to completely abandon the mandated National Curriculum! 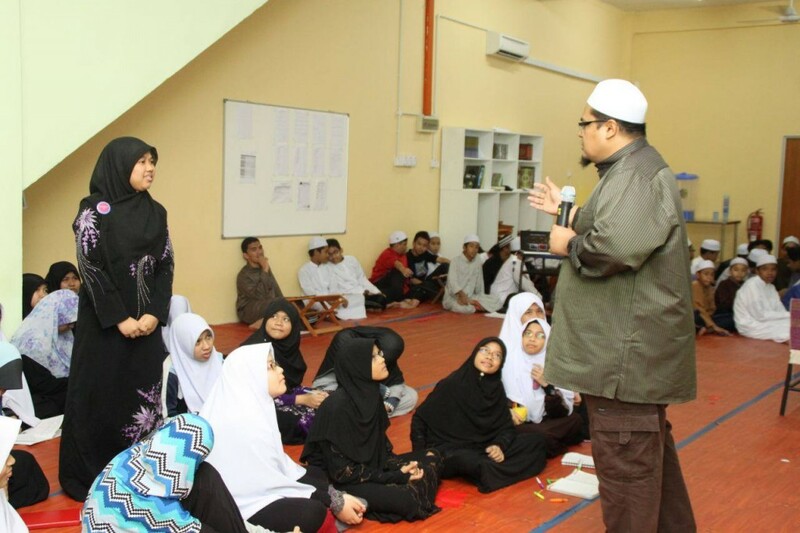 The entire curricular are hard to work on, to achieve what Khalifah School wants to achieve. They do not encourage inquiry and thinking. Mainly, learning is very much about memorising. That is one of the main contributions why our country scored poorly ranked number 54 out of 65 countries in PISA 2013. The government was unhappy, and drastically introduced HOTS (High Order Thinking Skills) to promote inquiry. But so far it didn’t really work because HOTS requires different culture of thinking and habits of mind. Students are not feeling safe to express their opinion, their opinions are not appreciated, and HOTS discussion in public education must follow some answer schemes! The transformation still does not trust the students and want them to follow what have been decided. Society still subscribe to grades and rankings. We discussed in length and determined to abandon the National Curriculum. We lost small number of students but the majority stay. We wanted to implement International Baccalaureate but we do not have the resources and experience. We finally chose Cambridge curriculum (IGCSE) even though English proficiency will be a big challenge to our students. We know that IGCSE to certain extend is still an exam oriented kind of curriculum, but we really appreciate the pillars of analysis, synthesis and communicating exist within the framework. This is what we need, and what we want, to nurture thinking and encourage inquiry. The reason why students do not have the spirit to ask questions is because they do not see or feel the lesson as relevant. They cannot relate what is in the classroom with what is there in their real life. So, we need to strategise that. We found, most of our students are having difficulty to express what they think and feel in sentences. They know many things, but they are reluctant to answer. We decided, for Year 1 classes (age 13), during the first month, teachers should explore the current knowledge of the students, before offering them new knowledge to be built upon it, and teachers should ask questions that require them to answer in words, rather than sentences. One student stood up, took the marker pen from me and wrote “reception hall”. Another one wrote “money”. Another one wrote “Qadhi”, “clothes”, “mahr”, “decoration”, “make up”, “reception party”, “fighting husband and wife”, “diapers”, “witnesses”, “wali”, “invitation card”, “professional cameraman”, “bank loan”, “jewellery”, “gold”, “diamond” and finally I got the whole white board written with so many funny, sad and strange things. Now, I asked them, “what shall we do with all these words?” One of them replied, “we organise them alphabetically, A to Z!” I asked, “what’s the benefit?” He laughed. “No benefit at all” he said. Finally I said, why don’t we categorise all these words into two categories, one is Syariah, another one is Custom. They agreed. We circled the Shariah’s words with green and the Custom’s words with blue. It turned out that only 1/3 are green, and 2/3 are blue. “What cause you headache the most? The Shariah or the customs?” I asked them. “The customs!! !” I got consensus from all of them. “Do you want to change the customs?” I provoked them. “Of course. We want to. We still have time!” some said. We laughed. “Okay, if you want to change the custom, you must first get the ‘license’ by knowing the Shariah. This subject will teach you the Shariah, only 1/3 of what you wrote just now, and then I wish you all the best to negotiate the customs with your family!” I concluded the 50 minutes class. Bloom’s Taxonomy together with SOLO Taxonomy are two resources which can really help students to nurture their habit of thinking. 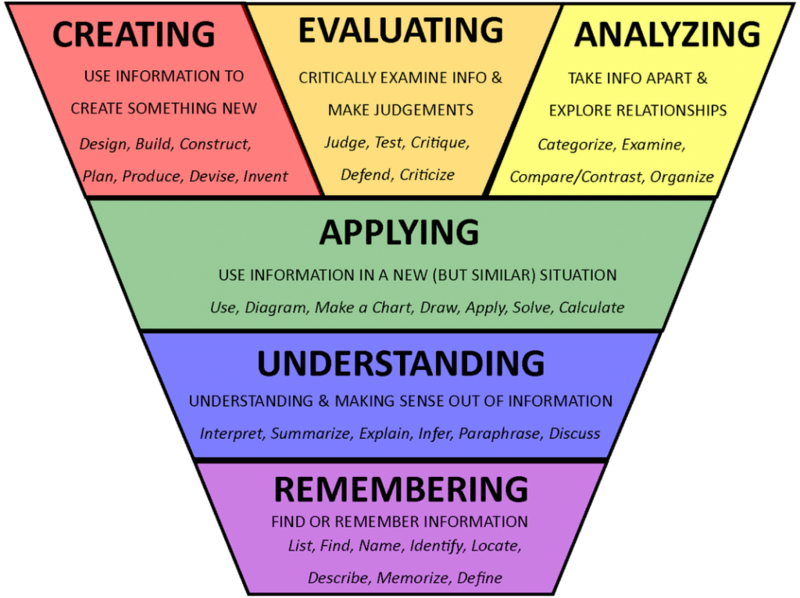 In our school, for Year 1 and Year 2 (We call them Foundation Level), we use Bloom’s Taxonomy to strategise questions in assessments, in teaching, and even in Halaqah after Maghrib prayer. When I gave talk on the Hijrah of the Prophet PBUH in the prayer hall (our school is a boarding school), I chose to speak only for 15 minutes on one topic and it was about the origin of Hijri calendar. After 15 minutes, I turned the session into quiz. Students are offered to choose, they want to answer question from which level of Bloom’s Taxonomy. REMEMBERING: The Hijri calendar was formulated during the time of which Khalifah? UNDERSTANDING: Why Hijrah was chosen to mark the beginning of our calendar, and not the birth of the Prophet or the beginning of Revelation? APPLYING: This year is year 1437, counted based on Hijrah. Let say, Islamic calendar begins with the birth of our Prophet PBUH, which year we are now in? ANALYSING: Compare the pro and cons of using Gregorian calendar against the usage of Hijri calendar. CREATING: Design a plan or program to improve the commitment of our school’s members to the spirit of Hijrah. As for year 3 and 4 students, we use SOLO TAXONOMY for deeper understanding, and helping them to move from unistructural understanding to multistructural, relational and extended abstract understanding. It is not easy, but we do not easily give up, biiznillah. We try to provide magazines, newspapers at every corner of the school, but most importantly we must work to create a genuine reason for students to pick them up and read, and then ask and discuss. Without all these, education became meaningless and stranded at transmission level. Teachers change their role from ‘teacher’, to ‘fasilitator’, and become the most hardworking ‘students’ in the school. Teachers are quite familiar with notions of modeling. However, this is often limited to instructional modeling, the “Now watch me and I’ll show you” kind of modeling. Instructional modeling certainly has its place, but it isn’t really a shaper of culture. The kind of modeling that creates culture is more subtle, ubiquitous, and embedded. It is the modeling of who we as teachers are as thinkers and learners. This kind of modeling can’t be “put on” for students’ benefit; it must be real. Students know if a teacher is passionate about a topic, interested in ideas, engaged as a learner, reflective, and deliberative. Education is amanah. May Allah guide and bless us all, the teachers.